For unforgettable holidays, we are expecting you at”Studios Stavros” with its enchanting view of the sea. Fully equipped with kitchen, bathroom, balcony, telephone, air condition and television, in a pleasant and hospitable environment. 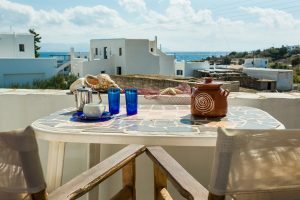 Our Studios, (for 2 to 4 persons), are located only 20 meters away from the most beautiful beach of Paros, Logaras beach.We also provide to our customers free internet (wi.fi ) access. Cleaning service is also provided daily for all our studios.